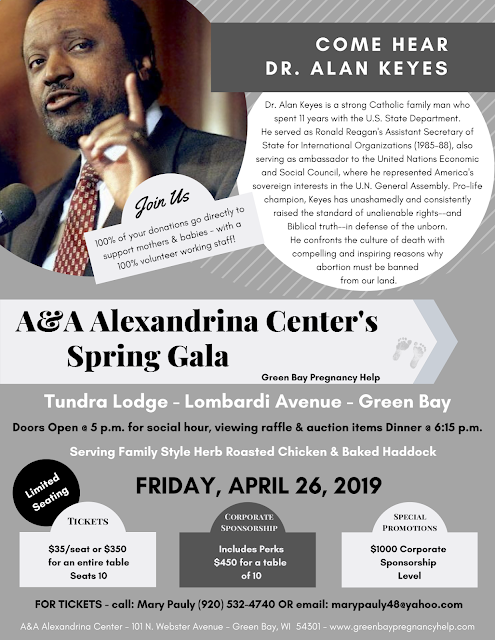 GB Pregnancy Help of A&A Alexandrina Center has been operating in Green Bay for two decades. The Center helps more than 2,000 women per year, administering more than 1,000 free pregnancy tests on average, and provides a host of services, and material help and support for women and children. Comment: FWIW, I saw Keyes speak about 20 years ago. BY FAR, the BEST speaker on pro-life I have EVER heard. Combines all we already know with that wonderful rhythmic black-preacher style and dynamic. Worth going to just for the style! !